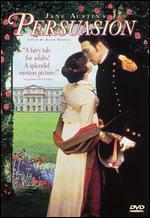 Persuasion is a 1995's BBC TV-film adaptation of Jane Austen's novel. It was directed by British theatre director Roger Michell and starred Amanda Root and Ciarán Hinds. The film premiered on television in Britain, but was released theatrically in the US and other countries.